Have you ever been in a situation where someone says to you, “I have something to tell you, and you’re not going to like it?” Do you instantly go on the defensive or maybe brace yourself for bad news. In certain situations, the person might be right in their assumptions about whether or not you’re going to like what they have to say. In other situations and a more common scenario is, the person deciding how you’re going to respond based it on their own personal feelings and how they would respond if they were in your shoes. The mistake when this happens is assuming you can read some else’s mind. Too often people project their own (limiting) beliefs onto other people. In the selling process, these “mind reading” assumptions show up in the way we answer our client’s questions. Of course, she had no idea what I’d be using the product for and frankly a $2.85 item for a VIP client is not going to discourage me from moving forward with the project. Maybe in her mind, this particular item does not seem worth $2.85, yet, telling a customer it’s too expensive is a terrible way to sell. For one, it may cause the customer to look elsewhere. It could also break down trust in the relationship when the customer disagrees with your assessment of what “too expensive” means. 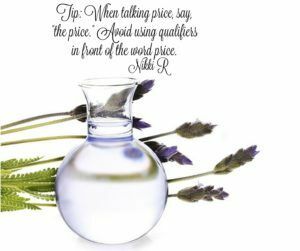 Your Savvy Selling Tip this week, when a client asks for pricing, answer the question with a straightforward answer, avoid adding your own beliefs about the value of the product in your answer. Let the client decide for themselves. In a Storytelling In Business training, I taught recently, a participant in the room voiced her concerns about the pricing her company was charging for a particular service. When I asked a few questions, it became apparent that the service was something she would never personally pay for; therefore she could not get her head around why anyone else would pay for the service. And, because of her beliefs, she didn’t think it was possible to sell the service. This particular company has been in business for years and has hundreds of clients that have already paid for the service, so there’s already evidence that people do find value in what’s being offered. Take a moment and think about how you’re answering the pricing questions. Are you offering flippant responses, like, “It’s going to cost you” or “It’s not something I’d recommend,” or “It’s expensive,” These responses may very well be costing you business and breaking rapport with clients.